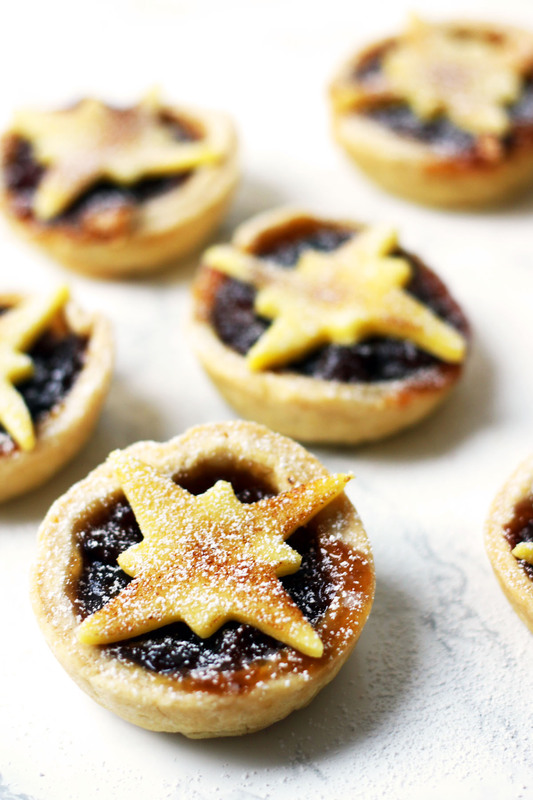 These Marzipan Mince Pies are a fun twist on a classic recipe! Scroll down to find out how to make them this Christmas. We have a tradition in our house that every Christmas Eve we make mince pies, and not a day earlier! It’s something I can remember doing from a very young age and even though I no longer live with my Mum you will still be able to find me stood by her side, in her kitchen, making mince pies on Christmas eve. My Mum is a fantastic pastry maker. Her hands are always freezing cold making it incredibly easy for her to handle the pastry without causing the fat to melt. Although I am not blessed with hands quite as cold as my Mum’s, my pastry does tend to come out beautifully short and crumbly – exactly how the pastry of a mince pie should be. I have clearly been trained well. As much as I love keeping to traditions, I am also keen to try and put my own spin on things now that I am older. In the past I’ve made my own mincemeat. The results were pretty impressive and I had intended to do the same this year but simply ran out of time. So, when it came to Christmas Eve and I was keep to experiment with my tried-and-tested recipe, I simply looked around my mothers kitchen for inspiration. And there it was. A squished up ball of marzipan leftover from making marzipan fruits, threatening to dry out and become useless, on top of one of her counter tops. I’d heard of adding marzipan to mince pies before. Blue Kitchen Bakes for example adds a small ball of marzipan to her mince pies before the mincemeat. But I wondered, what if you swapped the short crust pastry top of a mince pie, for a caramelised marzipan lid? Sweet heaven is what! Now it’s not enough to just replace the mince pie lid with marzipan. There’s a fine balancing act of heating the marzipan up enough to make it caramelised on top without it losing its shape or burning. You can achieve this in one of two ways but my favourite way is to add the lid after the mince pies have been baked and then run over them with a blow torch. If you don’t have a blow-torch, which I’m sure many of you don’t, one alternative is to put the marzipan lid on after they have been in the oven and then pop them under the grill for 5 minutes until they go crisp and golden on top. This works best if you are using a shape on top of the mince pie, as I have in the photographs. 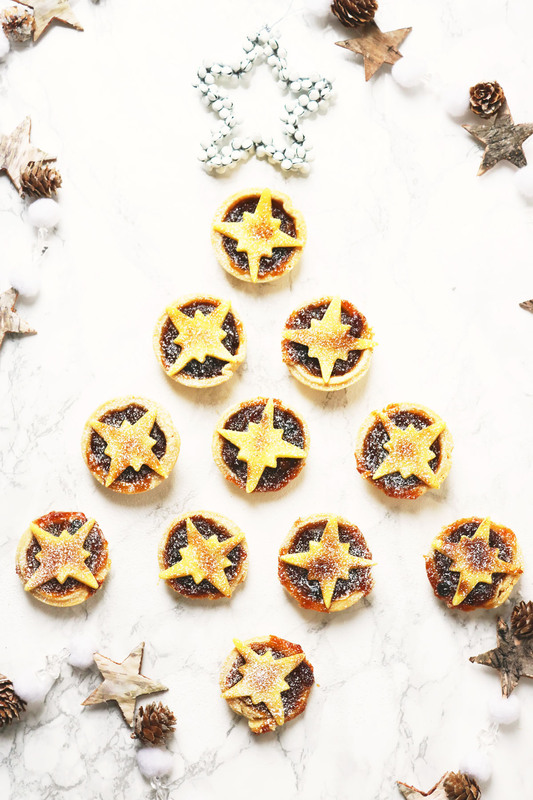 Mazipan mince pies are a fun twist on a classic Christmas recipe! Chop up the fat into small cubes and add to a large bowl with the sifted flour. Ensuring that you have cold, dry hands first, rub the fat and flour together using just the tips of your fingers until the mix resembles fine breadcrumbs. Once you have a mix the texture of breadcrumbs, add the water. Bring the mix together using a spatula or butter knife until you have a ball of dough. You may find it easier towards the end of this process to bring the ball of dough together with your hands. This is perfectly fine but try not to over handle the pastry, particularly if you have warm hands. Place the ball of dough into a bowl, cover with cling film and leave to rest in the fridge for 30mins. Grease cupcake tins with a little butter and preheat your oven to gas mark 4. Once the dough has finished resting, roll out onto a lightly floured surface to roughly 0.5cm thick. Using a circular cookie cutter roughly the same size as the cupcake tin you wish to fill, cut out the bases of your mince pies. You should be able to get roughly 18-24. Push these gently into the cupcake tins and then fill with a table spoon of mincemeat. Bake in the centre of the oven for 15-20mins or until the mix is bubbling and the edges of the pastry are crisp and golden brown. Remove from the oven and allow to cool slightly before removing from the tin and placing on a wire rack. While they are cooling, roll out the marzipan (again to roughly 0.5cm thick) and cut out your lids. I like to use a star shaped cookie cutter or holly leaf cutter. Place these on top of the mince pie. Swap the 50g of lard for another 50g of margerine. Turn the fat and flour into breadcrumbs by pulsing the mix in your food processor. So, now you know how to make the most delicious, marzipan mince pies. AND you’ve got plenty of time left to cook them if you’re planning on leaving one out for Santa. That’s all from me for now, so I want to take this last opportunity to wish you all a very Merry Christmas and a Happy New Year!